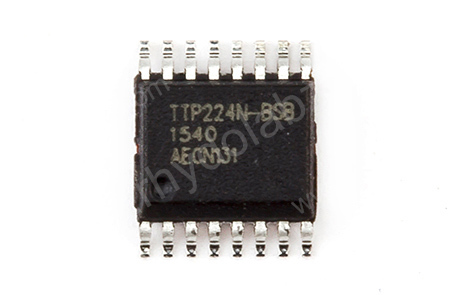 Description: The TTP224/TTP224N TonTouch TM IC is capacitive sensing design specifically for touch pad controls. The device built in regulator for touch sensor. Stable sensing method can cover diversity conditions. Human interfaces control panel links through non-conductive dielectric material. The main application is focused at replacing of the mechanical switch or button. The ASSP can independently handle the 4 touch pads with 4 direct output pins. Provides direct mode or toggle mode、CMOS output or open drain output active high or active low by pad option(TOG/OD/AHLB pin). Auto calibration for life, and the re-calibration period is about 4.0sec, when key has not be touched. Developed a touch control circuit with this IC. Easy to interface. Good sensitivity!!! !